St. Bernardus Prior 8 - Not pictured (late arrival), but it's a classic. Already reviewed here. 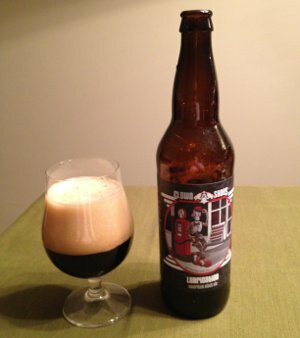 Southern Tier Creme Brulee (Imperial Milk Stout) - Another beer I reviewed a while back, this is one of the more interesting beers of the night. Massive aroma, intense flavors of chocolate, caramel, vanilla, maybe even some coffee. I could just sniff this stuff all night. Great stuff, maybe even a little better than I remember (though I think my chief complaint last time was that it's a bit too sweet to drink a whole bottle). A strange beer because I wouldn't call it one of my favorites, but it's so distinctive and interesting that I'd highly recommend it to just about anyone. A great dessert beer. Kaedrin Christmas Ale - My homebrewed winter warmer style beer (a kinda spiced red ale), this thing has to be my best beer yet. Very nice spicy aroma, picking up lots of that cinnamon and clove, tastes quite nice, almost creamy mouthfeel. I really hope this wasn't some sort of fluke. I should really do a recap of all my homebrews at some point on the blog, so no rating for now, but I would seriously put this up against any of the winter warmer style beers I've had over the past couple years. All in all, a pretty great night! We didn't manage to get to all the beers in the picture, though I ended up taking a can of pale ale home with me, so perhaps a review of that in the coming weeks... That's all for now. Beer Nerd Details: 7.85% ABV bottled (12 oz.) Drank out of a snifter on 2/3/12. My brother gave me three beers for Christmas, all of which were picked out by my nieces (9 and 7 years old). I've already mentioned the other two on the blog a while back, but this one looked familiar. I couldn't quite place why I recognized it, but I finally figured it out. Apparently this beer's label art caused quite a weird stir last summer when the Beer Advocate Events Director, Candice Alström, who found the label offensive. 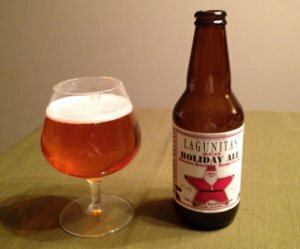 I don't want to get into the details (check the linked article above for that), but I find that claim for this particular label to be absurd (other Clown Shoes beers may be another matter, but there are many labels out there that are horribly sexist, so perhaps a more comprehensive tact would be more appropriate). Beer Nerd Details: 6% ABV bottled (22 oz. bomber) Drank out of a tulip glass on 2/3/12. I don't really see myself racing out to explore more from Clown Shoes, but I did appreciate the gift. Beer Nerd Details: 10% ABV on tap (10 ounces). Drank out of a goblet on 2/1/12. As I've made abundantly clear last week, I'm at a point in my beer obsession where I don't mind paying a little extra money to try something new and interesting. As a fledgling beer nerd, I had some initial hesitation on that front and I'm still a little suspicious whenever I see a single bottle going for more than $20. But for the most part, I've found those expensive beers worth the stretch. 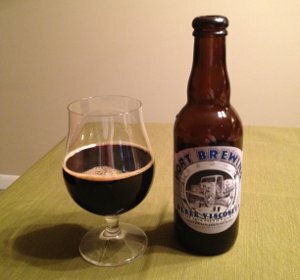 When I first pulled the trigger on a highly priced beer (The Bruery's Coton), the excuse I gave myself was that I was still relatively new to this whole good beer thing and that I was willing to spend a little extra to experiment with new and interesting beers. I suspected that I would grow out of that phase as I became a more seasoned beer nerd, but a couple years later, I'm not sure about that. I think I'm more willing to pull that trigger now than I ever have been before. It helps when the beer is as good as Coton was (I even went back and bought another bottle to age), though there have been times when I've paid through the nose for a beer I didn't particularly care for. It's true,our beers have become more expensive, and over the years, we have developed a reputation for beers outside the boundaries. These are what I refer to as flavor driven beers. Are they expensive? Depends upon what value you place on them. Stephen is obviously a fan and feels compelled to say so. For me, they are not expensive, they are merely priced at a higher point than conventional beer. And I don't believe we make conventional beer. He mentions a lot of things in his comment, including the cost of materials and ingredients and how barrel aging is a long and expensive process... but none of that really matters. Look, we're not communists here. We don't determine value by the amount of effort that went into creating the beer. We pay what we're willing to pay to get a beer that tastes good. It's our decision. Some of us might take into account how the beer was brewed (or supporting their local brewer, etc...), but most of us are more interested in the experience of drinking the beer and not the process of brewing it. Now, doing a high gravity, barrel-aged beer represents a significant investment on the part of a brewer, and thus we're going to have to pay more to get our hands on a bottle. I'm not saying that a brewer should take a loss on selling that kind of beer. But the true value of the beer is ultimately determined by the paying customer, not by the brewery. If that value is less than it costs to brew the beer, well I'm betting that particular beer wouldn't likely be brewed again (unless the brewer's got money to burn). The market sorts these things out, and so far, I don't think we've really seen anything too excessive (with the possible exception of retailer gouging, which the brewery has little control over). Beer Nerd Details: 12% ABV bottled (375 ml mini-magnum, caged and corked). Drank out of a tulip glass on 1/21/12. Vintage 2011. So there you have it. For me, definitely worth the premium, and I've got another bottle of the stuff in my cellar which I plan to check out sometime later this year. Or maybe next year. I also have a few Lost Abbey beers down there, at least one of which I plan to get to in the near future. And there's always the Mongo IPA and Shark Attack Red and probably a dozen other Lost Abbey beers I'd like to try. After some post-holiday procrastination, I finally settled down to make myself a small batch of a Simcoe single-hopped IPA. Hops are one of the 4 key ingredients in beer, and there exists an amazing variety of hops. Most of the bitterness in beer comes from hops, but they also provide flavor and aroma characteristics. Some hop varieties are good for bittering, but not for flavor or aroma. Some are great for flavor or aroma, but not really for bittering. And then there are the utility players - hops that do everything. Simcoe is one such hop. Simcoe is actually a relatively new variety of hop, often referred to as Cascade on steroids (Cascade hops were the most revolutionary of American hops - most notably featured in Sierra Nevada's classic Pale Ale). They're a high alpha acid hop (around 12-13%), which makes them great for bittering, but they also impart a huge, distinctive citrus and pine flavor/aroma. Brewers would draw off a small amount of the mash as it issued from the grain bed, fresh and warm. To this they added a dollop of Scotch. What happens is nothing short of mystical. Mash runnings are very sweet and flabby--there's no definition to the flavors. The addition of Scotch somehow reverses all this. Like an electric current, the Scotch animates the grains so that you can taste them in HD. The Scotch is likewise a very clear note, but not sharp or aggressive. It has all the flavor of a straight shot, but it's floating amid Mom's comforting malted. Insanely beguiling. 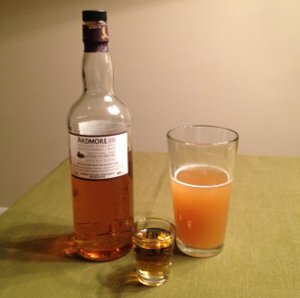 So I took a sample of wort, and threw a shot of Ardmore (it's a cheap Scotch, but it's got a nice, distinctive peat smoke character to it that's not overpowering) in there. Anywho, once the boil begins, I add in 1 ounce of Simcoe hops and start the timer. 30 minutes into the boil, I add the Golden DME and Turbinado sugar. When I do this, the temperature of the pot seems to drop (makes sense because I'm adding room temp ingredients), so I pot the lid back on the pot and bring it back to a boil (I'm not counting these 5 minutes time as part of the boil). Once it's back boiling, I add a half ounce of hops (the first flavor hop addition). 10 minutes after that, I add another half ounce of Simcoe (second flavor hop addition) and the teaspoon of irish moss. Finally, with 5 minutes left to go, I add the aroma hops (actually sprinkling some throughout the last 5 minutes). Moved the pot to the ice bath to cool it off, brought it down to about 80° F, strained the wort (removing the hops) into the fermenter, and topped off with about 1/4 to 1/2 gallon of cold water, bringing the final temperature down below 70°. Original Gravity: 1.068. Definitely lower than I was shooting for (my target was in the 1.070s), but assuming a 75% attenuation, this should work out to around 6.7% ABV, which will be a solid IPA. Add in that citrusy, piney goodness from the Simcoe, and I'll be a happy camper. I did notice a lot of sediment in the wort, even after I strained it into the fermenter, which has me a bit worried, but what else can I do? I guess we'll find out in a few weeks. I'm going to try something new with this batch - dry hopping! I talked to the guy at the homebrew shop and he said I could do it in primary, so I figure I'll wait a week or so (i.e. until fermentation ends), chuck in the last ounce of hops, give it another week, then rack to the bottling bucket and bottle the suckers. Exciting! Tell us about your growler collection. Tell us why you love growlers or why you hate them. What is the most ridiculous growler you've ever seen? Tell us about your local growler filling station. Ever suffer a messy growler mishap? Anything related to growlers is acceptable. I have to admit that I'm not a big growler guy. They have their uses and I've certainly availed myself of the growler's services, but it's an elusive creature - not something I frequently use. I don't really have any crazy objections to it, nor do I have a strong opinion about tap versus bottle (I like some beers better on tap, and others from the bottle). To me, they're just another tool in the beer nerd's arsenal. It's time to play Belgian Beer Roulette! It's a game we can all win more often than not, and so this time around, yes, I won. Maybe not a blowout, but a win nonetheless. Beer Nerd Details: 10% ABV bottled (11.2 oz.) Drank out of a goblet on 1/21/12. Every time I play Belgian Beer Roulette, I feel like I should do it again soon, and this time is no exception. But I should probably drink down some of my cellar before I play again! As I mentioned yesterday, sometimes my eyes are bigger than my liver. I tend to buy more beer than I drink, so my cellar has been growing of late, and I've even started intentionally buying beers to age. In yesterday's post, I covered what kinds of beers are good for aging. Today, I'm going to list out the beers I'm currently excited to crack open... in a few years. Also some beers I wasn't intentionally aging, but which will probably have an extra year or so on the bottle before I actually get to it. Alvinne The Oak Melchior - Ale brewed with mustard seeds and aged in oak barrels (which were previously used to age Cognac and Calvados Brandy). I've actually had this a while, but plan to drink it as soon as it fits in my schedule! Dogfish Head 120 Minute IPA 2011 (x3) - This one seemingly breaks a lot of rules for aging beer (it's pale and hoppy, for instance), but at 18% ABV, it's still a good candidate (and from what I've heard, it ages well). La Trappe Quadrupel Barrique (Oak Aged) - Batch 3, blend of new oak, old port barrel, and old La Trappe Quadrupel barrel aged beer. Exciting! Schlafly Reserve Barleywine Style Ale - Bourbon Barrel Aged 2008, so I guess it's ready! Not to mention 3-4 cases of homebrew and a bunch of other beer that's probably not suitable for aging. I didn't think I had this much beer sitting around. Yes, I need to get drinking. Hopefully a lot of the above won't be aged too long, if you know what I mean... I'd say only a handful of the above will really make it long term. At some point, it became clear to me that I was buying more beer than I was drinking. When I find myself in a liquor store with a great selection, I can't really help myself, and so I end up with a collection of beer that is growing faster than I can drink. And those 5 gallon batches of homebrew didn't help either! Thus began my beer aging experiment! I don't have a ridiculous program here, but my beer cellar has been growing. Sometimes by default - I bought too much beer, so it has to sit in my basement (or my fridge) until I can get to it. I know, that's a good problem to have, and I'm not complaining. But I've even started doing some intentional aging, and my initial experiments came to fruition this past holiday season. But this is a long process, so my experience isn't exactly comprehensive. Being a huge nerd, I've read a lot about the subject and I figured it'd be worth exploring my strategy on what beers to age and when to crack them open. Alcohol Content: The higher the ABV, the better the beer is suited for aging (and the longer you can age it). In my experience, super high ABV beers (i.e. beers above 12%) taste very "hot" when they're young. As they age, they mellow out a bit. Lots of people will say that those uber-strong beers are undrinkable until they reach a certain age, though that's not usually something I've found to be true. That being said, my experience with the 14% ABV Samichlaus is that the extra time in the bottle really does make the beer more palatable. 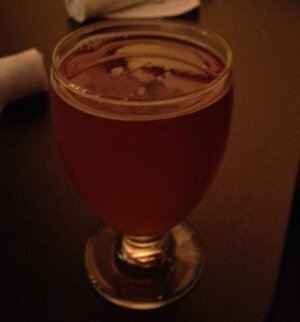 My tiny sample of a 2003 Dogfish Head 120 Minute IPA had clearly matured and become more complex than the fresh stuff. I've also tried some lower-ABV stuff (notably Anchor Christmas), which seemed to go ok, though it didn't taste that much different to me (of course, I had no comparison in that case, so it's difficult to tell). That being said, the general rule seems to be that beers less than 5% aren't really suitable for long-term aging. What you want are big beers like imperial stouts, barleywines, and big Belgian beers... stuff that'll get you truly sloshed on a single bottle, basically. Bottle Conditioned Beer: Beer that has been bottled with live yeast is much more likely to change over time. The yeast is still alive and processing the beer, so the beer will continue to evolve. A lot of Belgian beers are bottle conditioned, and some American brewers have experimented with this sort of thing. Dogfish Head's Squall was a bottle conditioned version of their 90 Minute IPA, and it was quite good! This is also why a lot of homebrewed beer gets better over time, as the yeast is still evening out the beer in the bottle. Anxious newbs like myself often post on homebrewing forums about how bad their beer turned out, but a lot of advice basically amounts to giving the beer some time (which personal experience shows is probably a good idea). I also see a lot of people noting that their best bottles of homebrew were the last few in the batch. 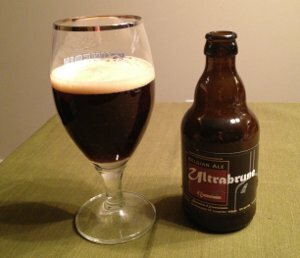 Dark Colored Beer: Everything I've read indicates that darker colored beers age better than pale beer. I've looked around for a scientific explanation for why this is so, but I haven't really found much (other than hops, which will get its own bullet below). My guess is that dark beer contains much more flavor elements, whether that be from various forms of toasted or roasted malt, or specialty adjuncts like caramelized sugars, etc... Anyways, dark colored beer like stouts, barleywines and Belgian strong dark, quads, etc... seem to be ideal. Malt, not Hops: Beers that rely mainly on malt for their flavors age much better than hoppy beers. Hop flavors and aromas break down quickly over time (and since so many pale ales rely so strongly on hops for flavor, perhaps that's why pale beers don't age so well). Again, Belgian beers seem to do well here, as they're very malt-focused. As are most stouts and Scotch ales, and lots of other styles. IPAs... not so much. Anecdotal and accidentally discovered evidence seems to indicate that this is true. I had a bunch of Founders' Centennial IPA a while back, but I let one of them sit a bit too long in the fridge. It was fine and I had no problem drinking it, but it was definitely much better when it was fresh. Smoke and Spice: I don't have a ton of experience with aging these, but I'm really curious to try some of these out after a while. I know I've read that smoke can act as a preservative in beer, and in my experience, that smoke character is usually overpowering in a young beer. My hope would be that putting some age on a smoked beer would let that smoke mellow out, while harmonizing it with the other flavors in the beer. Spiced beers are another question mark for me. I presume the spicy aromas and flavors will fade with time, but in some cases that could be a good thing (I'm thinking that overspiced pumpkin and holiday beers might benefit from that age). I've got a few spiced beers squirreled away for next year, so I guess we'll find out! Storage Conditions: Basically, a dark, cool place. Light is the enemy of good beer (light breaks down the compounds contributed by hops, resulting in lightstruck or "skunked" beer), and high temperatures tend to speed degradation. In terms of temperature, 50 degrees F seems to be ideal, though everyone stresses the need for a constant temperature over anything else. Also worth noting is that storing beers upright is important, especially for bottle conditioned beers (as the yeast should be settled on the bottom of the bottle). Wildcard: And finally, I'll probably age some random beers just because I want to see what happens with them over time. Or because I forgot it was sitting in the back of my fridge. Or because it's hidden somewhere in my basement. Who knows, maybe aging a questionable beer will pay off. How Long to Wait: The big question! It obviously depends on the beer, but my goal for purposefully aged beers is to buy multiples of the same beer and try them on a regular interval (once a year seems like a good idea, though the "waves" of maturation gives me pause for some beers). In other cases, it will be a bit more haphazard.